Can you identify the wedding guests in this photograph? A black and white negative of two unidentified female wedding guests at the Arnold/Young wedding at Arnhills in Pickering, Ontario. In this view they are standing in front of the residence. 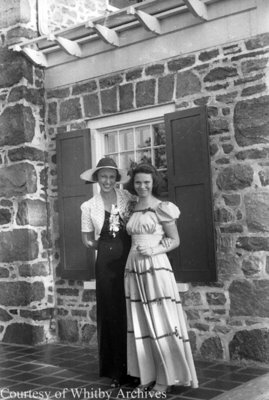 Lillian Arnold married Cromwell Young on 18 August 1939 at her parents’ residence known as Arnhills, in Pickering, Ontario. Harry Arnold (1877-1971) married Irene Curtis (1881-1961) on 6 June 1910 in Port Hope, Ontario. They had five daughters: Mary, Lillian, Thomasine (1915-1978), Ada (1917-1986), Elizabeth Margaret (Betty). The family lived at "Arnhills" in Pickering, Ontario. Arnold Family, August 18, 1939, Marjorie Ruddy. Whitby Archives A2013_040_776A.